We are ARTISTS for 47. 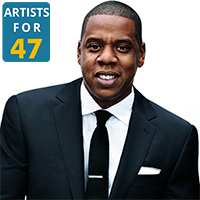 A coalition of artists that helped the passage of proposition 47, a historic initiative on the 2014 California ballot. Paid for by Yes on Prop. 47, Californians for Safe Neighborhoods and Schools, sponsored by Vote Safe, a project of The Advocacy Fund, with major funding from American Civil Liberties Union, Inc., and Open Society Policy Center. © Copyright 2015 Artists for 47. All rights reserved.